The art of fishing has been regarded as one of the most famous pastimes for outdoors enthusiasts for centuries past. Regardless of whether you’re a novice fisherman or a veteran Basshunter, nothing quite beats the enjoyment garnered from spending a day or two in the great outdoors. The fact that you could be fishing for your own lunch and supper, without having to waste too much money on stocking up on canned supplies and non-perishable foodstuffs to get through the days is just a welcome bonus on the experience of camping outdoors. However, as simple as fishing may look like, there’s actually much more to it than baiting your hook and casting the line in any given body of water. The gap between coming home with a barrelful of fish and a few handfuls of sardines is mostly bridged by the correct know-how regarding types of fish that reside in a given body of water, as well as the water temperature in which they usually come out, among other things. The vast amount of variables that you need to pay attention to in order to succeed at fishing makes this hobby far more difficult to get into than what most people believe. The fact is, fishing, like most other disciplines, requires the participants to study the trade in order to gear appropriately for the type of fish they’re setting out to reel in. However, there’s a cheat sheet of sorts for this particular hobby; one that comes in the form of fish finders. Fishing has been around for more than millennia now, but fish finders have only been around since the mid 19th century. Ever since the prototype finders were introduced to the general populace, veteran reelers, as well as their inexperienced colleagues, were able to get a general gist of the lay of the land - or water, in this case - albeit in low quality resolution, with unreliable accuracy, and with not much information about the type of fish, as well as the bottom structure of the body of water. By today’s standard, these prototype fish finders definitely left much to be desired. However, in a time where fishermen had to consider all the variables manually and learn to adapt by their own wits, any type of information that early fish finders could provide was better than nothing. Since that pivotal moment in fishing history, the fish finder industry has been constantly evolving, with their products getting more and more sophisticated with each iteration. Nowadays, modern fish finders can perform many tasks, such as storing data on SD cards, so you can take your maps with you everywhere you go, as well as take relevant notes regarding fishing hotspots, water temperatures, and the best times to go fishing in certain locations. Furthermore, most modern fish finders have GPS functions built-in, so you can orient yourself at all times, as well as pinpoint the best fishing spots in any given body of water, which is especially helpful if you’re exploring a new fishing location. Furthermore, most fish finders today will let you save map courses and even set them in reverse so you can easily make your way back home without a hitch. However, the single hottest thing with fish finders today is definitely the 3D feature, which can provide you photorealistic images of what’s beneath your fishing boat at any time. No longer does your screen show unidentifiable blobs on its screen. With 3D sonar technology, you can tell debris apart from abandoned cars, or waterlogged remains of sunken structures. This makes it easier to identify schools of fish, as well as the best places to cast your line. There’s much more to fish finders than what we’ve discussed so far. In this article, our aim is to help you identify what the important factors to consider when choosing a fish finder are, and to help you make the very best choice possible so that you can save money, and obtain a product specially tailored to your needs. As you can see, there is more to choosing a good fish finder than just paying for the most expensive ones on the market. If you really want to choose a product that is suited to your needs, you will need to carefully consider each of the variables we’ve listed above. If you’re not sure about where to start, you might benefit from checking out our list of top picks of best portable fish finders. While some of these might not be appropriate for your situation, they might give you a good idea of where to start looking. As we mentioned above, Xikezan is not a manufacturer that is exclusively dedicated to the design, product, and sales of fish finders. Nevertheless, we feel that their catalog offers some interesting choices when it comes to these devices. Case in point the portable fish finder they’re selling is actually quite powerful for the price. While the LCD display is a little short on both size and information displayed, it can actually show you, with great precision, the fish that are swimming under your boat, as well as their sizes and relative depths. This fish finder is better suited for freshwater fishing at shallow depths, as its transducer can only scan depths up to 120 feet. The 4.5” LCD display is big enough to show quite a few fish at a time, and is also backlit so you can still visualize it in harsh sunlight, or during the night when the sun goes down and natural light dims. 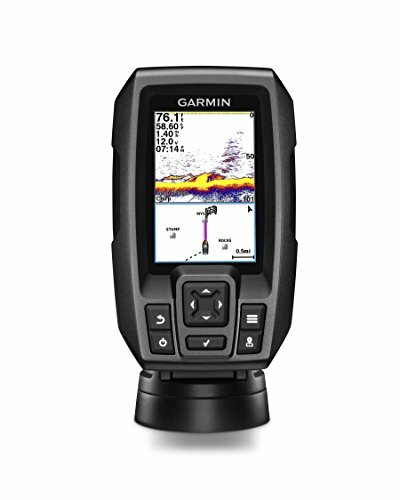 When it comes to Garmin fish finders, you will notice that their products often feature proprietary technology which is aimed to give them an edge over the competition. This fish finder, in particular, is equipped with a patented CLEARVÜ scanning sonar, which allows you to visualize virtually everything that is floating underneath your boat, while also being able to tell debris apart from fish, and other objects. The sonar technology is further complemented with the aforementioned CHIRP tech, which gives the fish finder even more precision, as well as the capacity to produce crisper images than the competition. This fish finder also has GPS functionality so the user can upload maps onto it, and even set their own custom waypoints so that they can plan their fishing trips ahead of time. The second entry by Xikezan on this list adds a new spin to the traditional fish finder formula, as this one consists of a high definition camera, which is submerged underwater, and can provide crystal clear images of what’s swimming below your boat. The camera is submerged underwater via a durable and sturdy cable which spans a total length of 15 meters. The cable itself is obviously waterproof, as well as resistant to the cold, and can support weights of up to 30kg. 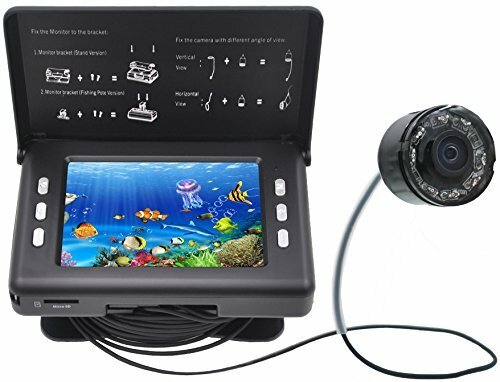 The camera of this fish finder is also obviously waterproof and, thanks to its night vision capabilities (complemented with an 8 piece infrared LED) can even track fish in low light environments. The images captured by the camera are projected onto a 3.5” LCD monitor with a built-in sun visor, which allows you view in real-time any and everything that is swimming under your boat, and allow you to land the specific type of fish you’re hunting for. Humminbird is one of the heavy hitters of the fish finder industry. 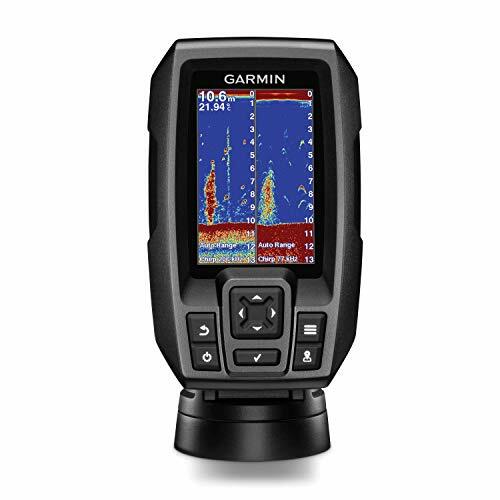 While Garmin as a brand may excel in their line of GPS first, and fish finders secondhand, Humminbird is solely committed to manufacturing and selling the best fish finders for both casual and veteran fishermen alike. This model consists of a spectacular 5” display, which makes it the biggest in this list so far. The size of the WVGA allows it display more information at any given time than other fish finders, while also allowing you to display multiple types of data in split screen fashion. The fish finder itself is powered by CHIRP dual beam technology, complemented by a powerful sonar, which allows it to track both small and large fish alike, in shallow to medium depth waters. The maximum recommended depth for this specific fish finder is 1,500 feet, so anything lower than this is fair game for the 410210-1. 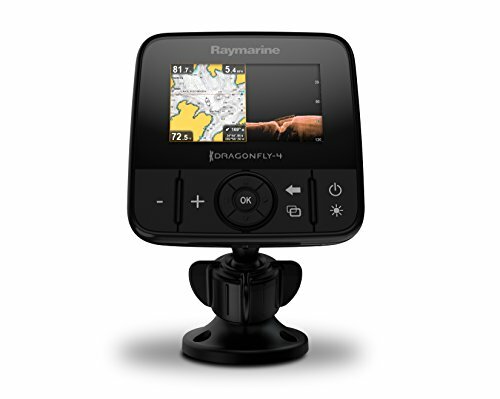 A cool feature of this device is that it’s compatible with SD cards, for those users that want to upload their maps onto the device in order to set their custom waypoints, and organize their fishing trip beforehand. 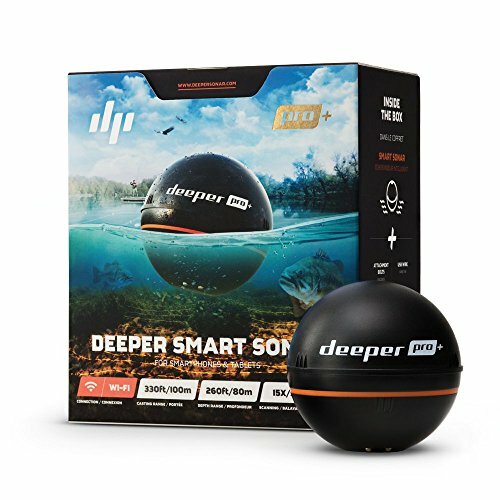 This is an interesting fish finder, as it encompasses both wireless technology and smartphone integration. The Deeper Smart Sonar Pro+ consists of a wireless transducer, which, after being submerged underwater, can be paired with your smartphone. In this manner, the transducer will relay all sorts of information, which is then displayed on the phone’s screen in real-time. 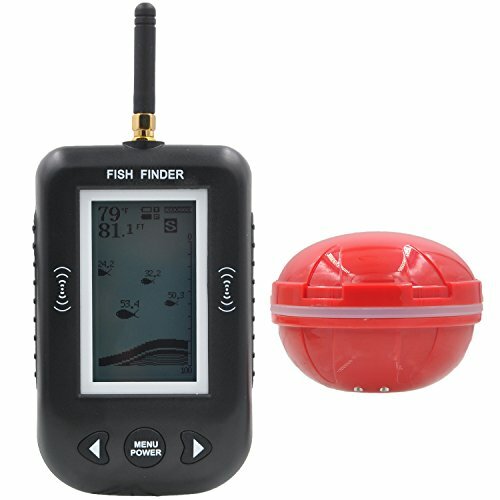 This fish finder uses the GPS function of your phone in order to keep track of your fishing exploits. It can be used to track fish in shallow waters of up to 260 feet of depth. 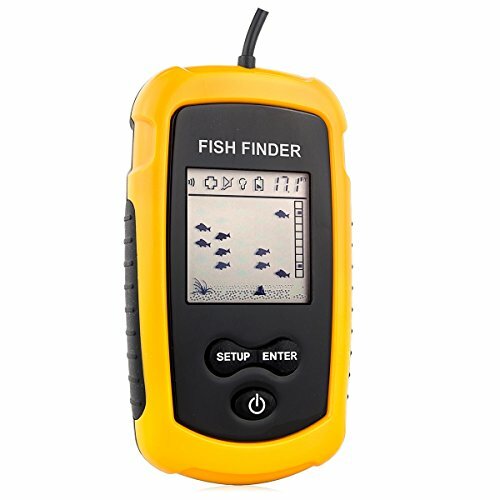 This fishfinder is not dissimilar to the striker mentioned above. This one, however, is an older generation, which can provide a similar performance at a cheaper price. The device consists of a 3.5” LCD display, with a transducer that uses CHIRP technology in order to transmit 200 watts (RMS) of power across a wide variety of frequencies, making this device ideal for tracking different types of fish at different levels of depth. This fish finder allows you to store maps and even make notes of your favorite fishing spots, as well as making waypoints that will allow you to plan your trip according to the types of fish you’re searching for. Raymarine is the manufacturer of some of the most powerful yet expensive fish finders in the market. The fact that their prices put them out of reach of many amateur or casual anglers only manages to earn it an honorable mention on this list. Regardless, this fish finder is equipped with a proprietary DownVision sonar, which uses CHIRP technology in order to create photo-realistic images of the fish and other objects lurking beneath your boat. The 4.3” LED backlit display also allows it to deliver crisp images to the user, and the fact that it’s backlit means that you won’t have to deal with nasty screen glare when the sun’s up, or need an extra light to view your fish finder in the darkness of night. Furthermore, with the use of Raymarine’s Wi-Fish technology, you can pair your smartphone to this device and stream live sonar data to it. This feature also allows you to store the fishing highlights of the day directly on your phone. This fish finder comes with several US lakes, rivers and coastal maps. With the purchase of this product, you will also receive a transom mount which can be used to perch it on your boat. 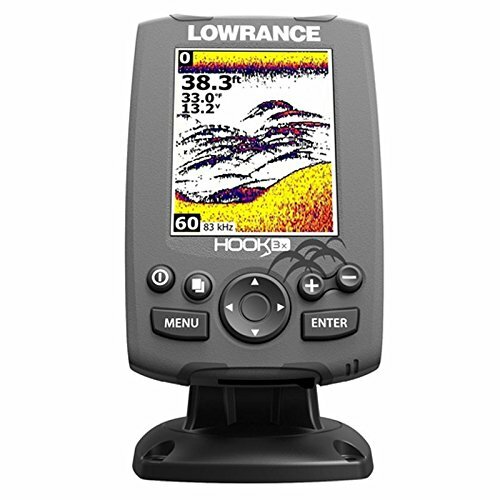 As we mentioned above, Lowrance is the company responsible for the existence of the modern fish finder. We owe it partially to them for the fact that we are able to use these products in order to obtain better results during our fishing escapades. Though their fish finders have come a long way from the first commercial ones back in the 1950’s, this fish finder earns its place on the list due to the fact that it’s a good alternative for anglers on a budget. Instead of the newer CHIRP technology, this fish finder operates in dual frequencies, which allows it to operate in either 83kHz or 200kHz, depending on the depth of the water you want to fish in. The 83kHz frequency can scan an area of up to 60 degrees, which allows it to pick up different types of fish across a wide area. The Striker 5DV is the upgrade of the Striker 4 mentioned above. This model comes with a new and improved design over its predecessors, along with several upgrades on its GPS and sonar functions. The result is a product that is both rugged and durable, allowing it to easily weather the harshest saltwater environments. Like the Striker 4 mentioned above, this device can be used as a GPS to keep track of popular fishing hotspots, as well as navigating tricky rivers, and setting custom waypoints in order to keep track of your movements. The CHIRP sonar used by this device also allows it to scan both shallow and deep bodies of water with great results, and the crisp 5” LD display allows it to provide crisp images of stunning quality and clarity. Last, but not least, we’re ending this article with a fish finder that excels not for its utmost quality, but for its price. The Venterior Portable Fish Finder is truly the definition of portability. This small fish finder comes packaged with everything you need to start scanning for fish, including a side-scan adapter, a neck strap, and a detachable transducer with a 25 feet cable. Though this product is not suited for deep waters, nor can it be used while moving at more than 5 miles per hour, but it can definitely help out to spot the fish that are swimming beneath your small kayak or rowboat. This product is definitely the go-to alternative for fishermen on a very tight budget. There are quite a few things you need to keep in mind when browsing the market for a good portable fish finder. The variables you need to consider, coupled with the fact that there are literally hundreds of models available online, can make purchasing a good product for your needs a real challenge. If you’re having trouble deciding on a specific model, then you might benefit from analyzing each one according to their specifications, and settle for the one that fulfills your requirements. Standalone Fish Finder: This is the first and most simple type of fish finder, ideal for hobbyist fishers who only need to see what’s below their boat and get a general idea of the lay of the land (or the water, in this case). These fish finders can, by far, provide with the most performance for the absolute cheapest prices, with a significant tradeoff in that they may not be suited for those that want to take up fishing as a competitive discipline, or for those that rely on their equipment to make a living. If you’re short on budget and want a product that could help you land more fish on your weekend trips, then standalone fish finders are your best bet. However, if you just got a big display, or have a big pilothouse suited for accommodating multiple displays, then you will benefit a lot from acquiring a fish finder with a bigger screen. If you wish, you may even buy a compatible GPS to pair with your standalone fish finder, and turn it into a finder/chartplotter combo. This leads us to our next category. Fish Finder and Chartplotter Combo: This type is most suited for those that want to make a business out of their fishing expertise. If you have a mid-sized boat and are looking to expand your opportunities on the high seas, then you will want a fish finder and chartplotter combo, which is a mid to high-range fish finder coupled with a GPS. 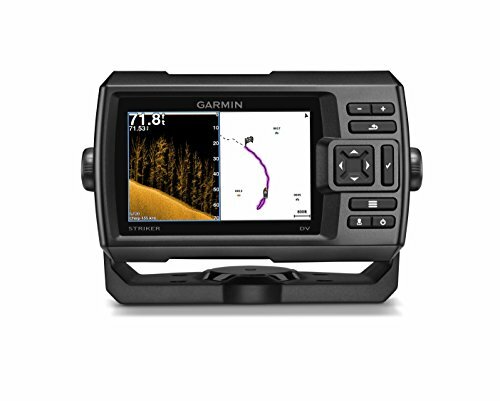 The GPS is used to navigate your way into the fishing spot where you will be spending your time fishing up a storm. You may opt to install these fish finder combos on a dual-screen setup, or on a single “black box” setup. These devices can be further expanded upon with the addition of a transducer, which is included with the purchase of most fish finders nowadays. Networked Fish Finder: Back in the day, these networked fish finders would go for a pretty penny. Nowadays, with the advances in sonar, wireless and GPS technology, most high-range fish finders can provide the user with tons of information about the waters they’re currently traversing. These devices are perfect for monitoring every aspect of the fishing spot you’re floating on. With the help of a transducer, these fish finders are able to pinpoint with great accuracy the types of fish swimming below the boat, as well as their relative depth. The most expensive models can also provide valuable information such as water temperature and will help you find your way across the water with help of their built-in GPS systems. Recently, there have been surfacing a new type of fish finder, with wireless technology which, when hooked up to your smartphone, allow you to monitor most aspects of the water below your boat without the need of pesky wires. The display is, by far, one of the most important aspects of the fish finders. As you browse the market you will notice that bigger fish finders tend to command a higher price, while also incorporating much more functionality into their repertoire. We’re not strangers to screen sizes; nowadays, every display is measured in inches. However, when it comes to fish finders, both the vertical and horizontal sizes gain a new meaning. For one, the vertical size of the screen plays vital role in the depth perception of the fish finder, as a taller screen will let you monitor larger depths. Similarly, if a screen has a bigger horizontal length, the objects displayed on it will be able to stay longer on screen, as they float by the transducer’s range, and float away into the vast expanse. When it comes to fish finder screen sizes, more pixels per square inch usually translate into more information being displayed on it at any given time. A bigger screen, in general, will help you identify more elements of the water you’re floating on, such as air bladders from schools of fish, fish that are wandering near the bottom, and even tell individual fish apart when they are floating too close to each other. However, keep in mind that in order to tell the information apart, your screen not only must be big, it must also be sharp enough in order to properly display details. Like many other things, the more you pay for your fish finder, the more you will usually receive in a quality product. One last thing you need to consider about screen size is the diagonal size of any given screen. This is the type of measurement used to define any given type of display (for example, when you refer to a display as a “20 inch LCD monitor”). A bigger and wider screen allows you to fit more information into it. Furthermore, widescreen displays will also let you monitor different types of elements via their split screen support. Besides the screen, the only element that is more important than the ones mentioned previously is the transducer. The transducer is the part of the fish finder that is submerged a few feet beneath the water, and that bestows upon the fish finder its marvelous tracking capabilities. We owe thanks to quality transducers for a lot of things, from providing information on the maximum depth that a fish finder is able to explore, the resolution of the images shown on the display, and the capability to tell apart different types of objects submerged in the water. Furthermore, the transducer is the sole component responsible for your fish finder’s ability to scan bigger depths, or wider angles, as it is the part that transmits sonar pings into the water, and receives them when they bounce back. The transducer then relays the information to the fish finder itself, which is then interpreted in order to display the information about what is currently lurking beneath your boat. Watts: The power of the fish finder itself, meaning what allows it to detect fish and other objects underwater, is expressed in watts RMS (root mean squared). This element is largely related with how well the elements on the screen will be displayed, especially in murky or dirty water. The high the watt (RMS) of the fish finder, the more powerful it will be, allowing the device to “see” further underwater, tell apart objects that are floating close to each other, and to accurately gauge the bottom of the water. For reference, a 500 watt (RMS) will be good enough for most coastal fishermen, while 1000 watt (RMS) or higher fish finders are mostly suited for serious fishermen who either make a sport or a trade out of their fishing expertise. Casual or inland fishermen might be OK with a weaker - and inexpensive - fish finder, of 200 or so watt (RMS). Frequency: This value is used to express the frequencies in which any given fish finder operates. Fish finders usually come in single frequency, dual frequency, multiple frequency, or broadband CHIRP systems. The type of fish finders will determine in how many frequencies they are able to operate. Your requirements will vary depending on the type of fishing you are looking to perform, but a general rule of thumb is that higher frequencies ( 200kHz, 400kHz, 800kHz, or higher), are more suited for shallow waters, as they can provide a clearer image, with a significant tradeoff of not being able to penetrate as deeply as the lower frequencies can. Those that are looking to perform deepwater fishing will want a fish finder that operates on lower frequencies, such as 200kHz or lower, or 50kHz to 80kHz for really deep waters. CHIRP Vs. Broadband: This decision is reserved mostly for those who want the newer versions of fish finders. The newer fish finders usually transmit on something called Compressed High-Intensity Radar Pulse, or CHIRP, for short. Where other fish finders transmit either in one or two frequencies, CHIRP fish finders transmit a signal that sweeps linearly upwards across different frequencies (from 20kHz to 200kHz, for example). Despite transmitting with less peak power than other conventional fish finders, CHIRPing devices make use of wide-band, frequency-modulated pulses, which can be long in duration, and put 10 to 50 times more energy into the water than other fish finders. Furthermore, CHIRP fish finders make use of digital matching and signal processing in order to create images with unprecedented resolution and target detection. The result is an image that will allow to tell even the smallest fish apart from each other, as well as being able to effectively tell the fish apart from the bottom structure. With traditional fish finders, the barrier between telling different types of fish apart is reduced from several feet at a time, to only a few inches, which allows the user to pinpoint with great precision the location of the fish they are currently hunting for. CHIRP fish finders are easily able to operate in waters that have depth ranges upwards of 10,000 feet. Most of them can also transmit in independent dual frequency mode which, with the use of multiple transducers, allows the user to configure each one independent of the other, and to receive information from each transducer on the same display, or by using a multiple monitor setup. CHIRP devices are able to transmit in both high and low frequencies, which makes them terrific for all types of fishing, from freshwater fishing in shallow waters to saltwater fishing in the depths of the high seas. Angle: With the arrival of better, stronger fish finders, the inland fishing scene has evolved considerably from its early days, when catching fish was a matter of trial, error, and lots of patience. The fish finders that use high-frequency transducers (200kHz - 400kHz) for fishing on shallow waters are now able to view in specific directions when submerged underwater, such as straight down, or 360 degrees. The manufacturers of fish finders often offer inland fishermen a wide (and often confusing) assortment of transducers with this specific function. So, picking the right one for the job can often be confusing, considering the wide variety of specifications such as frequencies, bandwidths, and the aforementioned specific direction in which the transducer is designed to look at. We now know that anglers who often participate in inland fishing won’t benefit from powerful fish finders that are able to scan into the deepest reaches of the sea. Instead, they will benefit tremendously by using a transducer that will allow them to scan a wider area. High-frequency transducers have shorter wavelengths, which can spread into a wide area, but with only shallow to moderate depth capacity. For reference, a 200kHz transducer’s wavelength is only about a quarter of an inch, which means that, with this type of transducer, your fish finder will be able to pick up fish as short as a quarter of an inch. A 200kHz transducer also has a range of 600 feet underwater. Fishers who practice their trade from a pier or in shallow rivers could actually benefit more by using fish finders with even higher frequencies, such as 600kHz or 800kHz. In short, for shallow waters and picking up objects in a wider area, use high-frequency transducers. If, on the contrary, you need to see deep into the sea or other bodies of waters, then the longer wavelengths of lower frequencies will help you pick up fish and other objects at upwards of 10,000 feet underwater. Last, but not least, the style of the fish finder will be the last factor you will need to consider in order to make a good purchase. The style will dictate the way the fish finder is mounted onto your boat; if it can be mounted at all. Thru-Hull: These are the most complicated to install, but usually yield the most benefits. The signal quality obtained from this type of setup is unparalleled. These type of transducers usually come equipped with both depth and temperature sensors, as well as a speed paddle wheel. Transom-mount: As the name suggests, these types of fish finders are fastened or screwed to the transom, while the transducer hangs below and behind the hull. The results from this type of setup are also good, but may be subject to a more turbulent water flow, as the transducer gets dragged through the water. Trolling Motor: These special types of transducers are clamped or permanently set inside the propeller hub of trolling motor, and can perform their functions from within these quarters. There are no actual “good” or “bad” fish finders when it comes down to style. However, depending on the type of boat, as well as the type of fishing you will want to perform, you need to select an appropriate style of fish finder for the task at hand. The difference between saltwater and freshwater fish finders is not so much a matter of different types of gear, but a difference in the transducers. The transducers are the components of the fish finder that are submerged underwater when the boat is in motion and is the sole ingredient responsible for the fish finder’s sonar-like functionality. Depending on the type of transducer equipped with the fish finder, the device will scan for fish at a wide or narrow-angle, and with varying ranges. Since freshwater fishing is mostly in shallow waters - compared to regular saltwater fishing - the user will want a transducer with a shorter range and wider angle of scanning. This will allow them to scan for fish in a wider area so they can cover more ground with their fish finder, and potentially find more fish when traversing rivers or other shallow bodies of water. For freshwater fishing, you will want a fish finder with a transducer that can scan at a 20 to 60-degree angle. There are a wide variety of fish finders for sale on the market, all of which have different specifications, such as screen sizes, portability, and a wide slew of features designed to make the fisher’s life easier. However, due to this variety of features, choosing a fish finder suited to the user’s requirements can be somewhat complicated, especially if they’re new to the business and don’t quite know what to look for in a fish finder. While this is not a company that manufactures and sells fish finders exclusively - they deal in all types of products for the outdoors and a few electronics - Xikezan is a brand that produces a couple inexpensive fish finders, which are awesome for use in freshwater fishing. While not very powerful, their fish finders are affordable and are great for casual or hobby fishers. This is one of the biggest companies whose trade is focused mainly on the manufacture and sales of GPS devices. Their products are designed for all kinds of purposes and are mostly geared towards terrestrial, though they also manufacture GPS devices for naval and aerial use. Garmin was founded in 1989 by Gary Burrel and Min Kao (hence the name GarMin), and is currently one of the biggest companies in the business. Their GPS devices are top notch, and their fish finders don’t let down on quality either. Most of these devices incorporate GPS technology and add all the features you would expect on a fish finder to the mix, turning them from a reliable map and guidance system to the most powerful fishing aid equipment money can buy. Their products can either be inexpensive yet reliable or expensive and packed with even more features than their budget counterparts. So fishermen that operate on all types of budgets can actually invest in a product from this manufacturer, and obtain a quality device for their money. The invention of the first fish finders can be attributed to this company when Carl Lowrance - an avid fisherman - shared his love for the sport with his two sons, which in turn were the first inland skin divers. Through this activity, they learned that most fish in any given body of water would concentrate mostly in schools and specific areas. Because of this, it became clear to the Lowrances that they had to come up with a device which would show fishermen where to concentrate their fishing efforts. The first electronic fish finder was designed by the Lowrances with several key factors in place: it was portable, compact, lightweight, and powered by its own batteries. Most fish finders at the time (1957) went for around $2000 at the time. Through the years, their fish finders have evolved to include more features, while remaining as affordable as the first iteration. Nowadays, Lowrance, along with other brands such as Garmin, Humminbird, and Raymarine, among others, remain as the biggest contenders in the industry. Raymarine Marine Electronics is one of the biggest manufacturers of marine electronic devices for fishermen of all categories. Their products are geared for both hobby fishermen as well as small to medium-sized commercial fishing vessels. The fish finders manufactured by this company are some of the most modern devices available on the market, incorporating cutting edge features such as LED displays, powerful transducers, proprietary sonar technology, and so on. While not technically the most affordable devices, Raymarine fish finders are definitely in the high-end of the quality spectrum. With one of these fish finders, you weekend fishing trip yield can go from landing a handful of fish to several bucketfuls of fish, without wasting any time searching high and low for hotspots. 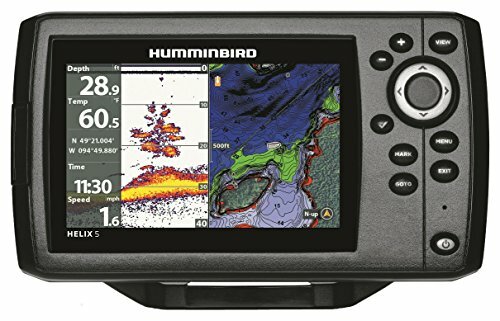 With a trajectory spanning over 40 years of experience in the fishing trade, Humminbird has become one of America’s favorite fishfinder companies. With their innovative Side Imaging Technology, both professionals and amateurs can focus more on the game, instead of spending hours upon hours searching for the best spots to cast their lines. This company pioneered the use of depth sounders, marine radios, and GPS systems to sports anglers. Even today, they’re focused on adding more functionality to their portable fish finders so that their users can further enjoy their fishing trips, getaways, and family adventures. As you may have gleaned from this article, there’s actually much more to buying a fish finder than simply throwing money at the issue and getting the most expensive one on the market. There are a wide variety of factors you need to consider before making your purchase. We hope that, after reading this article, you are a little bit more familiar with the things you need to know before purchasing a portable fish finder.